Patuha is the highest point of the Kaitake Range, a coastal lowland forest which forms a part of the Egmont National Park. 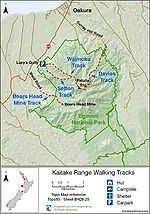 The Kaitake Range is situated just 15 kilometres south-west of central New Plymouth and is the backdrop to the small coastal township of Oakura which is located just north of the range on Surf Highway 45. The lowland forest of the Kaitake Range is remarkably different from the rest of the Egmont National Park. A wide variety of warmth-loving semi-coastal forest and smaller plants grow in profusion over what was once a mighty volcano. Tucked at the foot of the ranges, Lucy’s Gully features large stands of exotic redwoods, eucalyptus and Douglas firs. 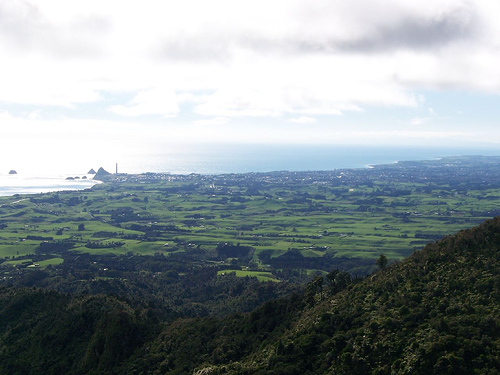 A trip to the Patuha trig offers trampers 360 degree views toward Mt Taranaki and the Pouakai Ranges, and over New Plymouth City, Paritutu Rock, the Sugarloaf Islands, coastline and farmland. The DOC ‘Kaitake Range Factsheet’ provides the following instructions. “Take the South Road (SH45) from New Plymouth to access the ranges in two ways. 1. From SH45 turn left at Wairau Road just past Oakura. Turn left again into Surrey Hill Road to get to the start of the Davies Track. It?s about a 20 minute drive from New Plymouth. 2. Pass through Oakura and from SH45 turn left at Ahuahu Road to get to Lucy?s Gully and the Waimoku Track. At the top of Ahuahu Road at Lucy’s Gully, there is a carpark and toilet next to where the track begins. If able to have a car at either end of the track, the preferred option would be to complete the length of the track from Lucy’s Gully to Surrey Hill Road. This route would also pass the smaller Kaitake Peak (645m). Walking from Lucy’s Gully via the Waimoko Track to Patuha Trig and returning back to Lucy’s Gully via the Sefton Ridge Track (or vice versa or back the exact same way). Walking from Surrey Hill Road via the Davies Track to Patuha Trig and back the same way. Starting at Lucy’s Gully, crossing over Patuha and the smaller Kaitake Peak, and ending at Surrey Hill Road (or vice versa). See images below for map. 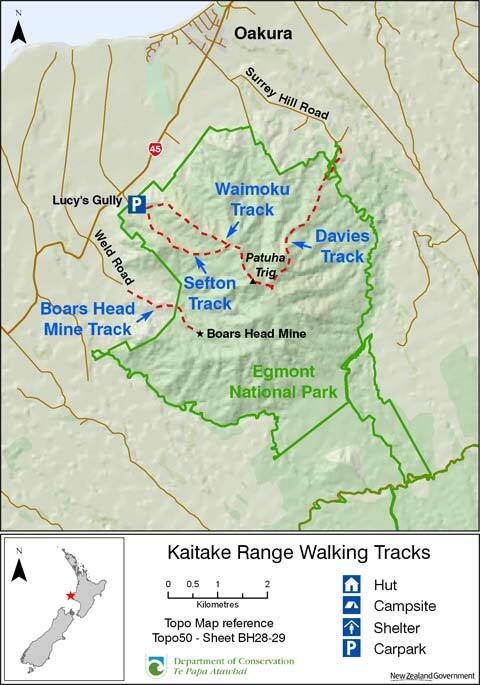 Kaitake Range Walking Tracks (Department of Conservation).